The Baroque era, related to art and architecture, developed in Europe from the early 17th to mid-18th century, emphasized dramatic, bold, curving forms and elaborate ornamentation. The horses bred during this time echoed this style, but their history actually extends back more than 2000 years. In recent decades the Lusitano, Andalusian, Lipizzaner and Friesian horses have seen resurgence in popularity, but with a modern twist. 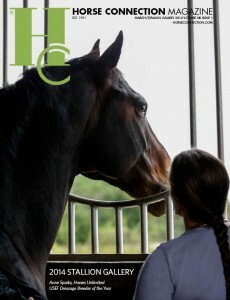 hooked,” says Jennifer Thurston, who breeds Andalusians, Lipizzaners, and crossbreds at her Weaselskin Equestrian Center. The Baroque horses trace their ancestry to the horses raised on the Iberian Peninsula in what is now Spain and Portugal. These equines were bred for warfare, which emphasized a hearty constitution, good temperaments, and the ability to perform the movements that would become the airs above the ground. The horses were known as Andalusians and were praised throughout the ancient world by such notables as Greek horse master, Xenophon. Eventually the breeding of Iberian horses was influenced by the Moorish occupation of the land and the introduction of the Barb. The resulting horse maintained its good qualities and was considered the ultimate horse even as governments flourished and diminished. With the emergence of Renaissance ideals during the 1500’s, horsemanship and the art of riding were re-introduced to society and became a mainstay of the royal palaces. The Spanish horses were among the most prized possessions of the royal families. The Hapsburg family liked the Spanish horses so much that they developed breeding stations at various outposts of their empire. The Spanish-breds were then crossed with the local breeds resulting in the development of the Lipizzaner. These horses were very selectively bred and used in the military and for the riding schools and thrived throughout the Renaissance and Baroque periods. In Friesland, a Dutch province bordering the North Sea, another horse was developed—the Friesian. This brave, handsome horse descended from Roman warhorses crossed with Arabians and Spanish horses. The result was a horse that not only was strong enough to pull carriages and participate in trotting races, but also had impressive gaits and a fantastic temperament. With the rise and fall of governments, the Spanish horses and Friesians nearly disappeared. However, the twentieth century saw the reemergence of the popular Iberian equines in the form of three breeds: the Andalusian, the Lipizzaner, and the Lusitano. 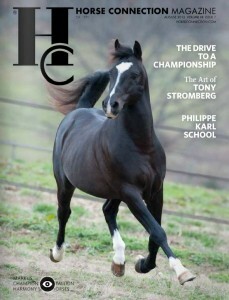 The Friesian also has thrived with the establishment of the Het Friesch Paarden Stamboek, the FPS, the royal studbook in Holland as well as a counterpart in Germany. In contemporary breeding, all Lipizzaners trace their lineage to the horses produced in the Hapsburg Empire. Modern political situations in the Iberian Peninsula have resulted in the emergence of two breeds. What was once a purebred Spanish horse has become the Andalusian. Lusitanos are horses of purebred Andalusian breeding that are born in Portugal. What kept Baroque horses from becoming extinct despite the political turmoil they have been subjected to, is their incredible presence and personality. 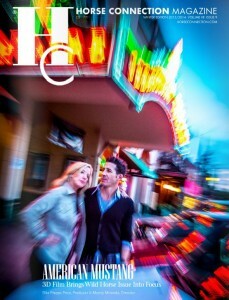 And in recent years, these traits have been rediscovered by a new group: the adult amateurs. “I think the reason [adults love these horses] is we appreciate the smooth gaits, the ease of training, and the intelligence,” says Kris Garrett, amateur rider and breeder of purebred and crossbred Andalusian sport horses at Grand Prix Andalusians in Parker, Colorado. 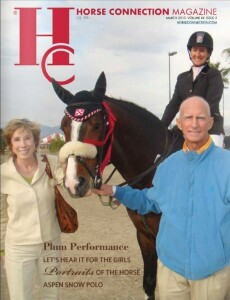 “[These horses] are generally sensitive horses who respond to every command. “The Spanish were ruthless in culling. If there was a horse with a bad temperament, it was gone; [the genes] were not passed on,” she says. Garrett was converted to the Andalusian from Quarter Horses and Paints. “I still have a fondness for a good bull dog type Quarter Horse, but whenever I saw an Andalusian in a movie, the horse would take my breath away. After years of coveting a long haired Spanish beauty for myself, I finally took the plunge and bought a gorgeous mare.” It wasn’t long before Garrett and her Grand Prix Andalusians was chosen as the retirement home for Temerario VII, a champion grand prix dressage stallion and former star of Medieval Times Dinner Theater in California. Now a thriving breeding program keeps Garret busy. Thurston also was converted to the joy of the Spanish horse after years of working with other breeds. . “They have an inherent connection to people and easily pick up on the horse/human relationship,” she says. Fans of the Friesian horse have also found that these powerful, impressive horses not only have the athletic ability for the show ring, but an eager to please temperament. “He’s not what anybody expects him to be,” says Paula Marsh of her Wyn de Plumm, a 1999 Friesian stallion. 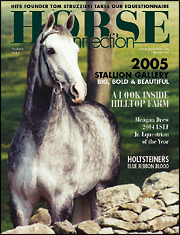 Wyn was the 2003 Keuring Reserve Champion Young Stallion in the United States and in 2004 he passed his stallion performance test, earning 10s for character and temperament as well as high performance scores, including a 9.5 for jumping and an 8.5 for canter. Wyn is now in dressage training with Grant Schneidman of Westmanton Stables and the pair has already taken home several USDF All Breeds Awards. 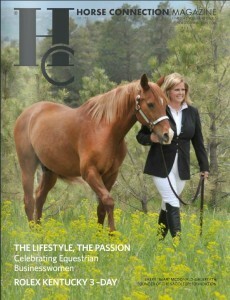 “We were just pleasure riders looking for a trail horse,” explains Marsh of her accidental discovery of the Friesian. It was not just the breed’s good looks, but its fantastic temperament that encouraged her to not only stand Wyn de Plumm at stud, but also to purchase three Model mares to begin their own breeding program at Wyning Edge Friesians. 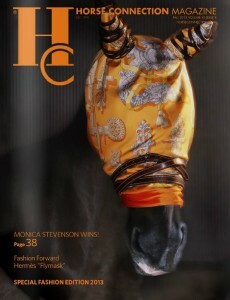 For the rider who wants both a friend and a competitive, athletic partner, the Baroque horse is often the right match. The Spanish horses are known for their ability to collect, rock back on their quarters, and stay light in front, making them ideally suited for the movements of dressage. 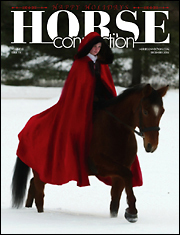 However, some dressage competitors have criticized the conformation that suits collection. 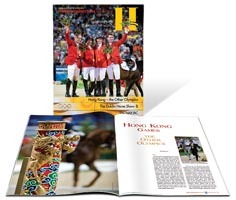 There are several international riders that have discovered how to bring out the best in their Spanish-bred horses. 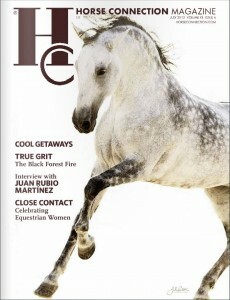 Rafael Soto and his Andalusian stallion, Invasor, have earned top scores at some of the most prestigious competitions in the world, including 10’s for piaffe work, which helped the Spanish team win the bronze medal at the 2002 World Championships and the silver medal at the 2004 Olympics. 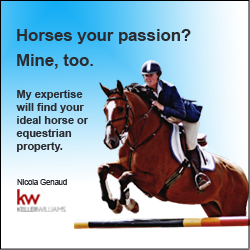 capable of competing with the best warmbloods. Iron Spring Farm in Coatesville, Pennsylvania, has been a top American warmblood breeder for 30 years. 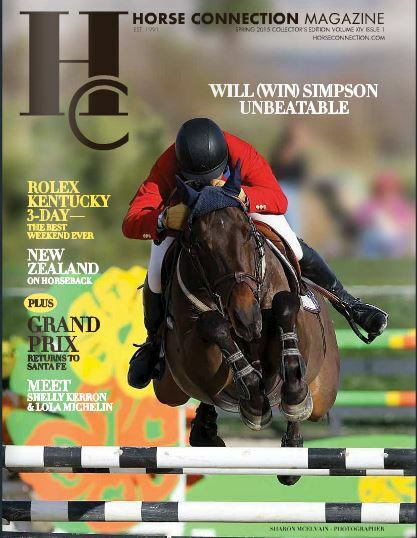 However, they have succumbed to the charms of the Friesian and now stand several top Friesian stallions, including the grand prix star Goffert 369, to their impressive roster of warmbloods. 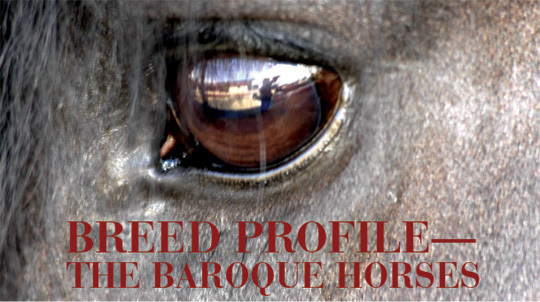 The only negative about the Baroque-bred horses is their numbers. The Lipizzaner was nearly wiped out during unstable political situations and numerous wars. In Spain, the purebred horses have also diminished in numbers and while the Friesian has become extremely popular, there are still very few in comparison with other breeds. This has resulted in very few horses for sale. “People don’t usually let them go,” Garrett says. 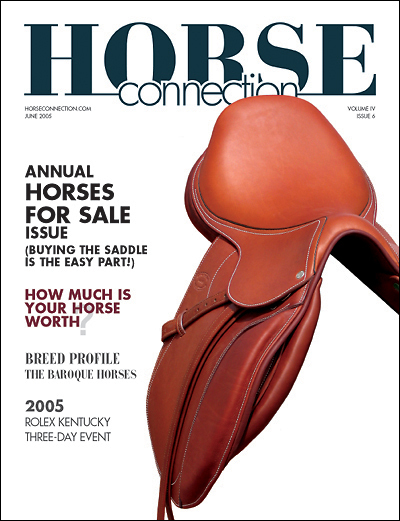 Even breeders who are in the business of making sales, will often only have a few horses available for purchase. 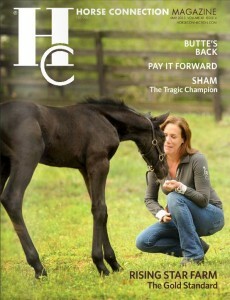 In addition, because quality mares are difficult to obtain, many breeders will not part with the fillies they produce. This lack of availability of breeding stock has made crossbreds the horse of choice for many people. Andalusian, Lusitano, and Lipizzaner stallions crossed with Thoroughbred, Quarter Horse, and warmblood mares often results in a sport horse that is suitable for a variety of disciplines. 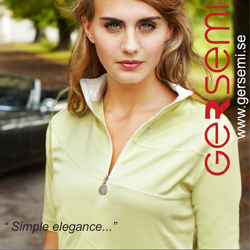 And the Friesian cross is also gaining popularity. 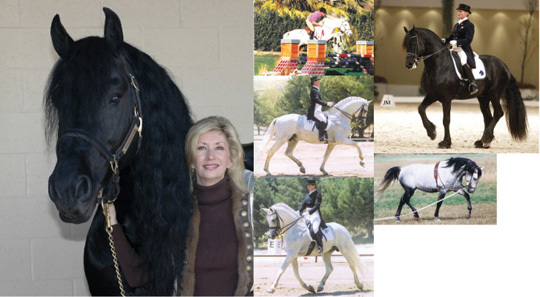 Even breeders like Royal Palm Friesians, home of the purebred stallion Tim, believe that Friesians crossed with other breeds can result in a superior sport horse.